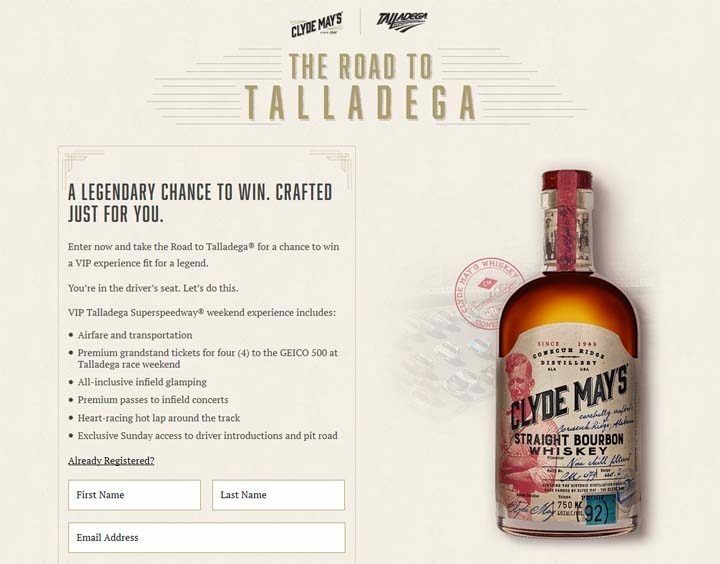 The Road to Talladega Sweepstakes is open only to legal residents of the fifty (50) United States and the District of Columbia who are at least twenty-one (21) years old. The Road to Talladega Sweepstakes ends on November 15 at 11:59 p.m. ET. During the period, visit RoadtoTalladega.com and follow the links and instructions to complete and submit the registration form. You may enter one (1) time per day. ONE (1) GRAND PRIZE: A trip for Winner and three (3) guests to Talladega, Alabama. Trip package will consist of: round trip, coach-class air transportation for four (4) from a major airport near the winner’s or each guest’s home to an airport servicing the Atlanta, GA area; one (1) night’s Glamping accommodations in the infield; ground transportation to and from destination airport and hotel; four (4) Premium Grandstand Tickets for Saturday and Sunday, April 28 – 29 GEICO 500 race weekend at Talladega; premium passes to infield concerts; race day garage and pit walkthroughs; exclusive access to Sunday Driver Introductions; exclusive access to Pit Road on Sunday; and exclusive access to Hot Shot Laps. Approximate Retail Value (“ARV”): $5,000.